3) Activate remote plugin. Open default URL from settings (x.x.x.x:4316) Screenshot attached. I can confirm this when running openlp as installed from ubuntus standard repos. When running from 2.4.x source code it works fine, so it looks like some of the remote-files was not bundled correctly for ubuntu. Hm, Is the "jquery.min.js" damaged in Ubuntu package? There are JS errors. See the differences in the attached screenshots. Yes, this is correct. On Debian (which is where Ubuntu gets its package from) the packaging requires that the system jQuery be used instead of the one bundled with OpenLP. Those symlinks look a little weird though. I replaced the "jquery.min.js" symlink (/<email address hidden>) with file from OpenLP source (/openlp/trunk/openlp/plugins/remotes/html/jquery.min.js), and remote plugin works well :-). I think, this jquery version (1.11.3+dfsg-4) in not inappropriate for OpenLP. Ah, so that's the actual problem. I'm renaming the bug report. Is this fixed in 2.4.3? It works for me. After upgrading to Ubuntu 16.10 bug is still present (OpenLP 2.4.3 [2.4.3-1 or https://get.openlp.org/2.4.3/openlp_2.4.3-1_all.deb]). 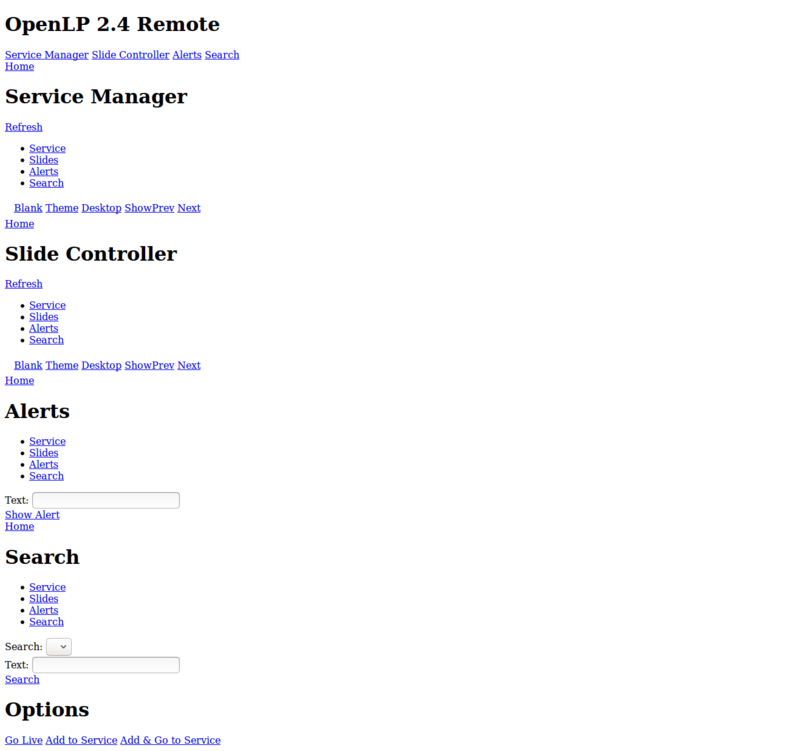 I see that there are many deprecated jQuery features in /openlp/plugins/remotes/html/js/openlp.js. What is your preferred way? 1. To bundle jQuery 1.7 jquery.min.js to Ubuntu package? 2. To update /openlp/plugins/remotes/html/js/openlp.js script changing deprecated jQuery features? Maybe I can work on it, if you prefer this way. It is not fixed in 2.4.3. I have a fix on its way, please be patient. Trunk is being redeveloped so this is not relevant. @trb143, I tested https://get.openlp.org/2.4.4/openlp_2.4.4-1_all.deb but this bug is still present (Ubuntu 16.10). Unfortunately it seems that my bugfix didn't make it in, it got lost along the way. Just wanted to report that this is still an issue on OpenLP 2.4.4 on both Windows and MacOS versions of the app. Apparently this has to do with the remote plugin using jQuery version 1.12.x which no longer contains methods lie $(...).live() which were deprecated on jQuery version 1.7.x. Hopefully this gets fixed soon as the remote plugin is something that we use a lot. Here is a workaround for this issue for MacOS but the same can be done for the PCs (I just don't have the correct path at the time). in there replace the file jquery.js and jquery.min.js with the jQuery version 1.8.x (1.8.3 is what I tested it with); you can download it from here https://code.jquery.com/jquery/. No need to restarting the app; things should just work. Again, the same can be done in Windows/PC I just don't have the path of /plugins/remotes/html at the time of this posting. Hope this helps someone. It looks like 2.4.5 should have the fix and trunk does not need one according to trb (comment #14).